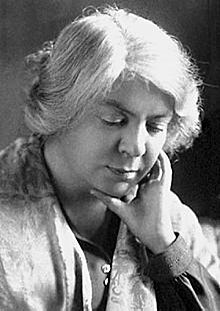 Grazia Maria Cosima Damiana Deledda (Italian pronunciation: [ˈɡrattsja deˈlɛdda]; 27 September 1871 – 15 August 1936) wis an Italian writer wha received the Nobel Prize for Leeteratur in 1926 "for her idealistically inspired writins which wi plastic clarity pictur the life on her native island [i.e. Sardinie] an wi depth an seempathy deal wi human problems in general". She wis the first Italian woman tae receive this honour. This page wis last eeditit on 19 August 2016, at 18:49.